We got hit by snow storm Hercules last night to midmorning today. The snow itself accounted for little accumulation, only six inches or so, but the frigid wind was another story. The temperature is around 3ºF now but the strong wind makes it much colder. I’m really concerned for our honey bees, that they may not survive this winter. I left the snow covering the entrances the way it is, at least for overnight, to cut down the wind and frigid cold blowing through the hive. 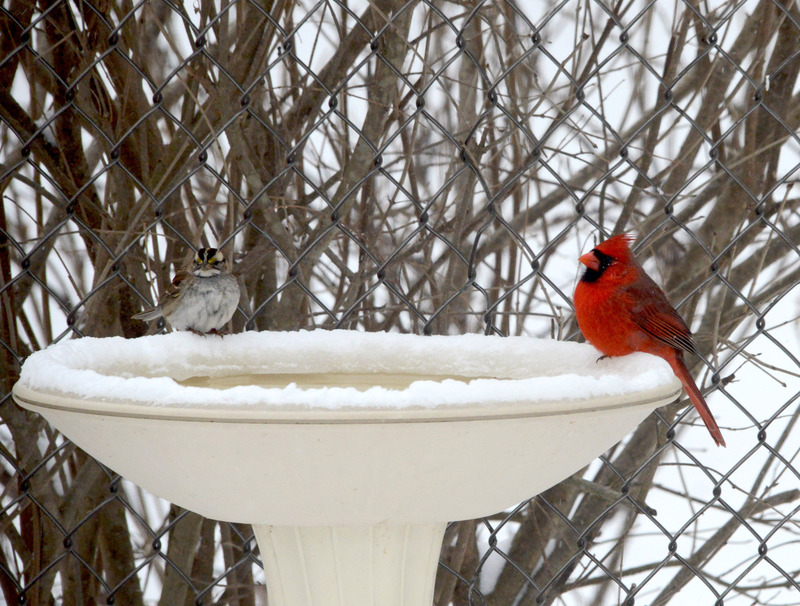 In this harsh weather we make sure that the bird feeders never go empty, and the heated birdbath is filled. 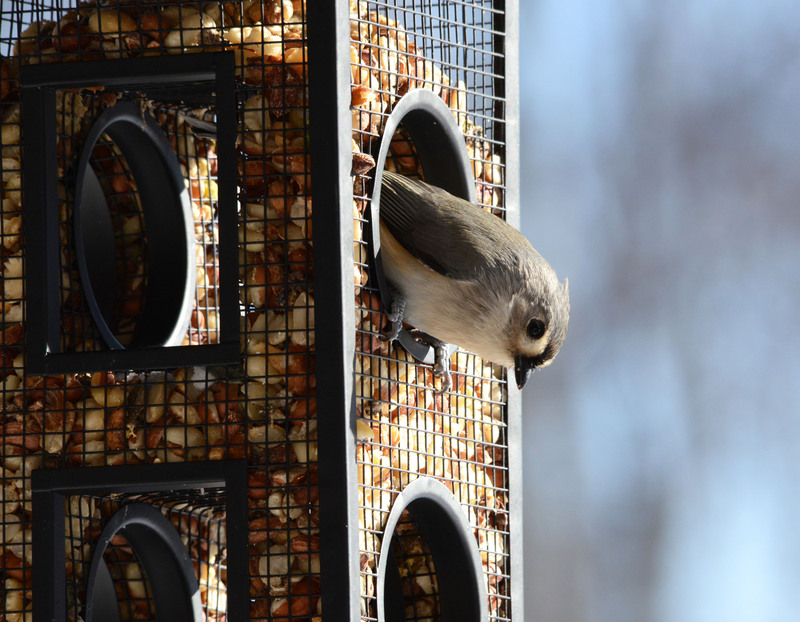 We depend on wild birds to do insect control in our garden and with the advent of harsh weather their well being depends to some degree on us. 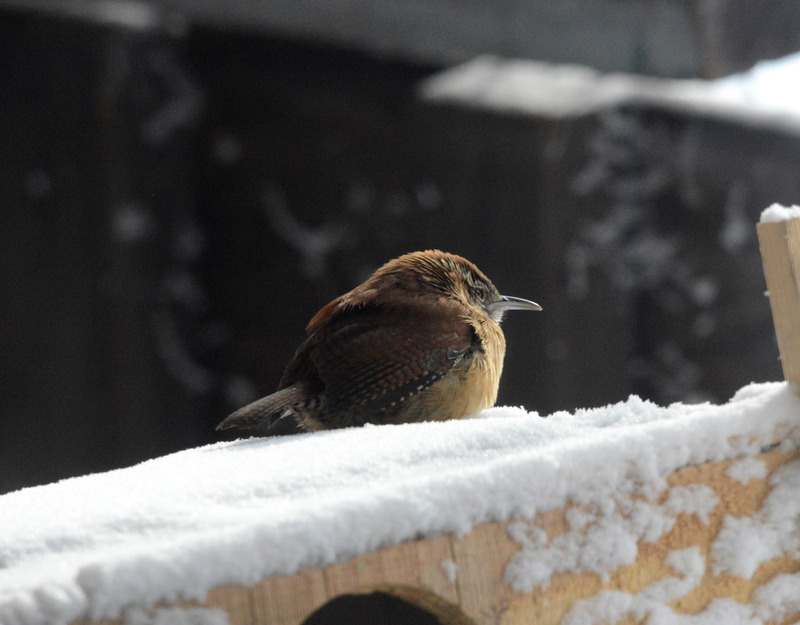 We also enjoy their chirping and their dancing in the snow. The dancing is actually the way they alternately tug one foot under their feathers to keep it warm in between hopping around for seeds. I was snowed in for the most part this morning. With coffee in hand, I parked myself right by the patio door and watched the activity outside. A never ending stream of birds came by for food and water. Some of them took refuge in between the joists under the patio roof, but most of them came in for food and warm water. I was surprised to see two Eastern Bluebirds checking birdhouses. Maybe they sense that tonight’s temperature is predicted to go down below zero. The photos here were taken through the patio door. I like to keep my fingers intact. I have difficulty operating a camera with gloves on and no gloves while outside today wasn’t an option. Hope your temperatures warm soon. We were at 19 this morning and the birds are puffed up so much they seem to be twice their normal size. The honey bees are worrisome. You had already insulated them, isn’t that right? You really have some great shots. Would never have guessed they were taken through the glass. I see these same feathered friends, except possibly the sparrow is different. This week I joined the local Audubon chapter. it meets nearby and I hope to improve my bird ID skills. Stay warm. Saturday was a -4 degree but today it reached 49 degrees and all the snow is gone. I have no idea how the bees are doing but I think they are still alive since the heat from inside the hive made a hole in the snow just right by the entrance. I’m not really sure that the insulation works well for them below 0 F. temperature, but it’s better than nothing. I still have difficulty identify birds, especially sparrows. There so many types of sparrow and most of them look similar to me. One great book I love for identifying birds is “The Crossley ID guide” for Eastern birds published by Princeton University Press. 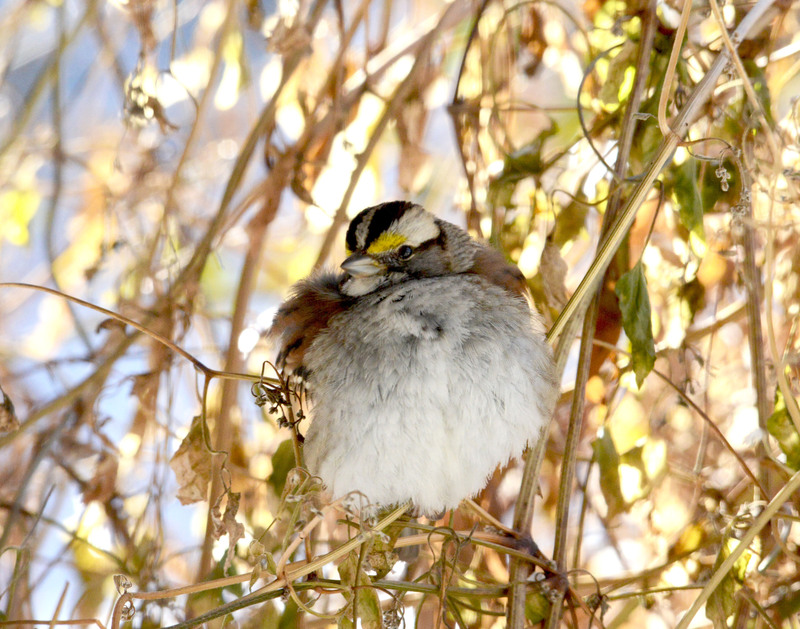 Enjoy bird watching and the Audubon! I’m thinking of putting up a blind with an electric heater inside and set up my gear in there. That way I can wait comfortably for these little puffed-balls to come around. Wonderful reference to a margarita with the snow rimmed bird bath simulating salt! The photos are lovely as always. 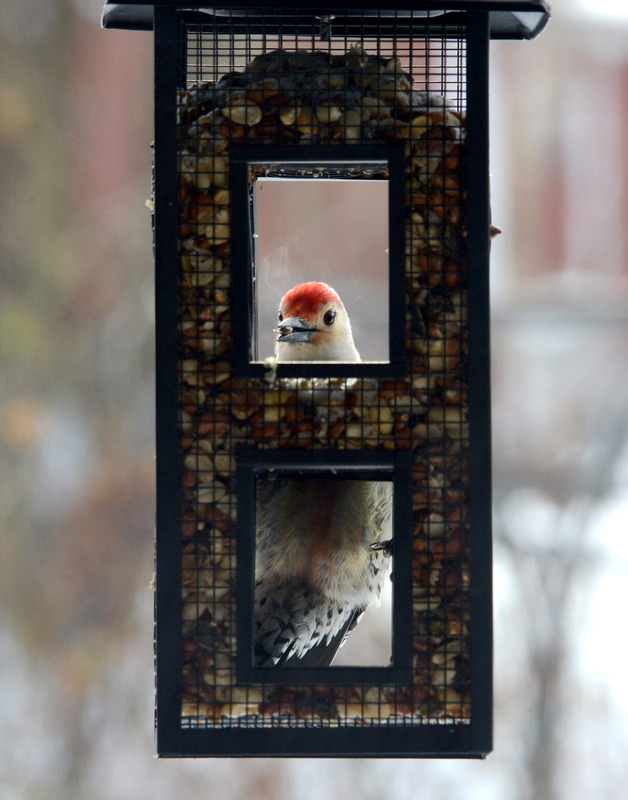 Like the ‘looking through the window’ effect for the woodpecker shot. It was pure luck to get that ‘looking through the window’ shot. The Red-bellies are very skittish, just a little movement and they are gone. Miss your sunset and Southern birds shots though. You should do more photography because you do come up with very good compositions.